Tired of waiting months for final approval of written documents like government policy, regulations, briefing notes, reports and communications materials? By one estimate 75 to 90 percent of the steps in these types of processes add no value to the end result. The good news that many government departments have done it better by applying Lean process improvement tools and techniques to figure out where bottlenecks occur and resolve them. Lean process improvement for document creation, review and approval is a one-day workshop that teaches a range of Lean tools and techniques to help you map out your document creation and approval process and pinpoint the steps that do not add value and are slowing you down. Only when these "non-value added activities" are identified can they be made to work more efficiently or sometimes, be designed out of the process altogether. 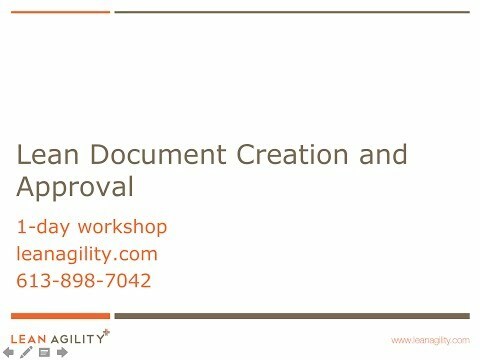 In addition, this workshop provides Lean solutions to address the most common challenges in the document creation and approval process: too many review loops, preventable work; the 8 Lean Wastes, too much work-in-progress, invisible workflow, unclear direction (voice-of-the-client) and waterfall development. What is Lean? How does it work?